Though the metaphor was used in the context of racial equity, Schultz thought it applied just as well to the media — journalists often focus on individual events and problems, rather than the underlying forces that cause and connect them. He didn’t use the words “systems thinking” when he wrote a column on the topic, but we recognized what he meant right away. It’s the mindset we’re bringing to newsrooms across the country through a series of workshops on systems thinking and design. The Journalism + Design team connected with Schultz and his colleagues at The Herald-Sun and The News & Observer, two McClatchy-owned papers, to host our first in-newsroom workshop on systems thinking. Schultz is spearheading an ongoing series at the Herald-Sun, Story of My Street, to explore how gentrification and rapid development is affecting residents in Durham. With so many interconnecting factors and consequences, it’s a topic that’s ripe for a systems thinking approach. Schultz has two main goals with the newspaper’s gentrification project: giving people factual information they can use to have a public discussion about what is happening in Durham and providing a platform for people whose voices and experiences don’t always get heard in day-to-day reporting. 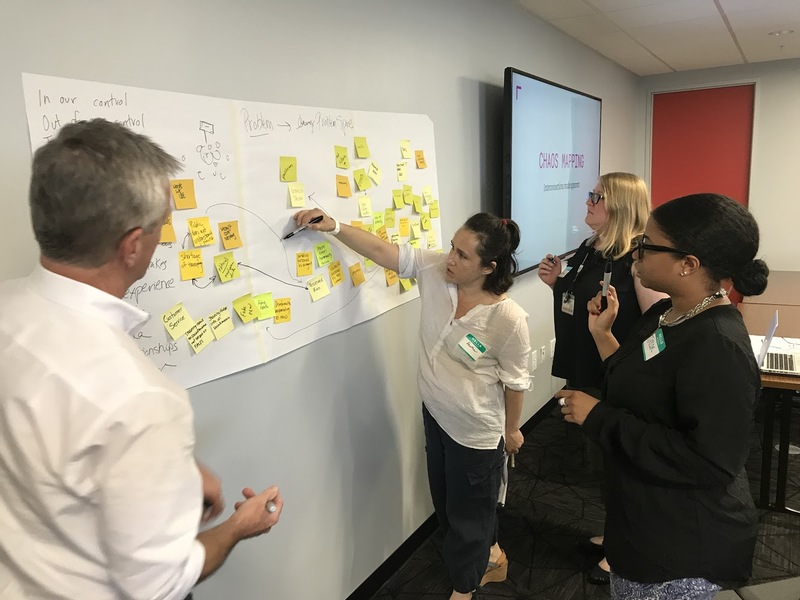 J+D went down to the News & Observer’s offices on June 13 and 14 for two, half-day sessions with a group of staff from the two newspapers to apply a systems thinking lens to the team’s reporting on gentrification. For our first half-day session, we introduced participants to the core concepts of systems thinking. We created chaos maps — visual representations of the many forces contributing to gentrification and outlined feedback loops representing how those forces feed into one another. 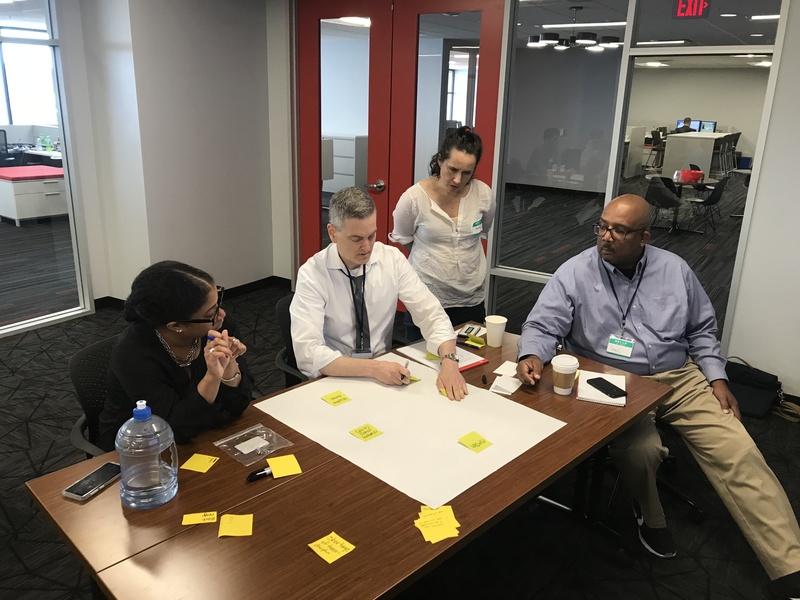 The group of ten journalists identified 75 unique factors that contribute to the system including community revitalization efforts, racial inequality, displacement, tourism, and lack of affordable housing. After sorting through the connections between these forces, we honed in on two topics that stood out for the group: the rate of evictions in Durham, an issue that the Herald-Sun has reported on recently, and a “school-to-prison pipeline,” which intersected with both the education and criminal justice beats of two reporters in the room. We focused on these topics in our second session, leading participants through a process of identifying and mapping the various stakeholders, organizations, and types of people who are affected by or contribute to the issues. With these stakeholders in mind, we led participants through a series of brainstorming exercises that generated new ideas for covering these issues creatively. The ideas included creating a community advisory board that would inform their reporting on juvenile justice in Durham and conducting a listening tour that would give the public an opportunity to share stories about evictions and housing-related issues with reporters. At the end of the workshop, the group emerged with both a sample systems map that visualized many of the forces contributing to gentrification and a list of concrete ideas they could employ to connect more deeply with people in the community around their reporting. 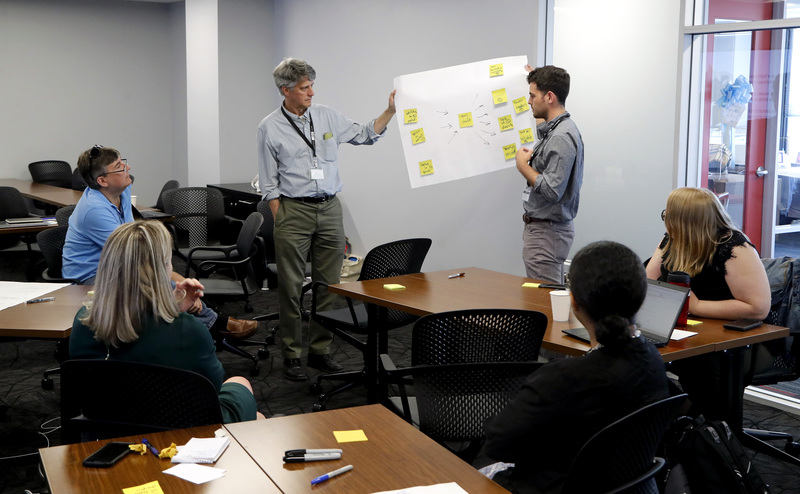 Schultz raised an important point during the workshop: The systems and stakeholder mapping exercises we collaborated on were all vulnerable to the assumptions and biases of the reporters and editors in the room. Participants could only see the parts of the system that they’re already aware of, which inevitably leads to gaps in the overall map. 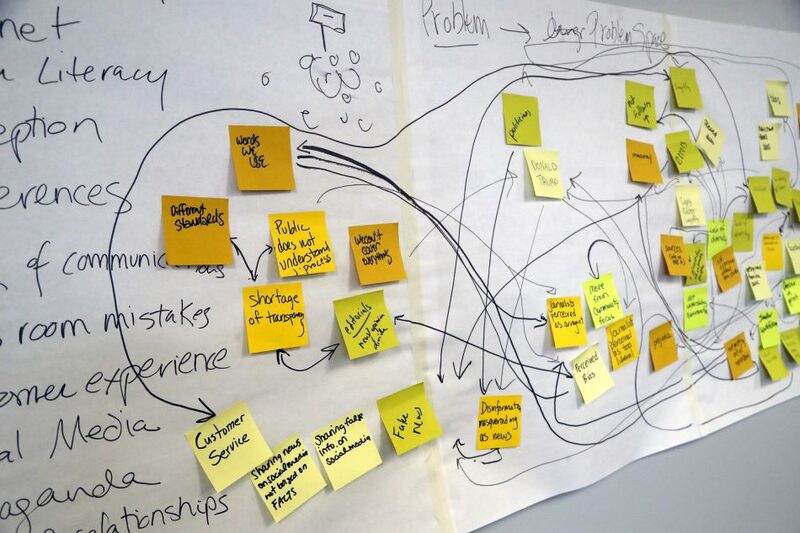 When used in a social change context, creating a systems map requires months of work, and involves a much more rigorous process of discovery to surface and illustrate how different forces connect and contribute to a particular issue. The maps we create in these short workshops won’t show the complete story, but can help identify areas for more reporting. We’re also eager to work with journalists on building systems maps in collaboration with stakeholders outside their newsrooms, drawing from perspectives and insights they may not have internally. This would create richer and more representative maps for journalists to better understand the full context of the issue. We believe journalists can use systems thinking as a catalyst for a nonpartisan approach to reporting on inequality and systemic problems and provide a path for newsrooms to be a moderating force within those systems. Going forward, we intend to root our systems thinking workshops even more deliberately in how newsrooms can account for complexity, help the public understand how power works and is distributed, and spark change through in-depth, community-centered reporting.